Lewis, Michael. Boomerang : travels in the new Third World. W.W. Norton & Co., 2011. 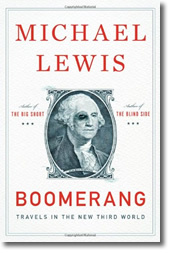 Underlying the amusing new book Boomerang is the sad truth that the global economic crisis is far from over. 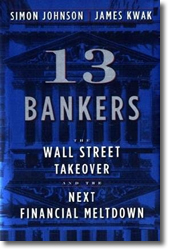 In the US, the federal government took over the sub-prime loans made by Wall Street banks. And in Europe, massive private debt was also absorbed by their sovereign governments. Because people borrowed far more than they could pay, the amount of worldwide debt has more than doubled since 2002. In Europe, there are at least six nations that are unlikely to pay off their debts. What then? Sounds depressing, but in the hands of an expert writer like Michael Lewis, this story becomes a fascinating combination of economics lesson and cultural analysis. Lewis traveled throughout Europe to explain how the national character of each country played a different role in how the crisis evolved. In Iceland, young fishermen with little training but with a high tolerance for risk became private bankers who leveraged capital by trading assets among themselves at inflated values. In the end, Icelanders amassed debts amounting to 850% of GDP. In Greece, Lewis found an astounding level of waste, theft and bribery. Greek banks loaned 30 billion euros to the Greek government where they were stolen and wasted. Raising revenues has been impossible due to massive tax fraud and Greeks have taken to the streets to resist making changes. By contrast in Ireland, real estate developers used leveraged capital to go on a building boom that bankrupted the country, yet Irish people were resigned to covering the losses. In Germany, bankers who made conservative investments at home were too trusting of the games played on Wall Street. 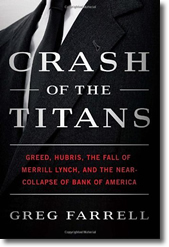 They lost giant sums in the risky American subprime and in Greek government bond markets. Lewis claims that this is in keeping with a German obsession with orderliness, and their fascination with excrement. At the end of the book, Lewis traveled to California, where his evaluation of Americans was even harsher. 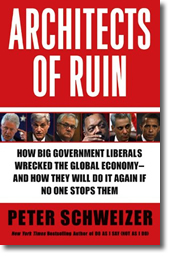 As long term interests were sacrificed for short term rewards, cities were bankrupted. Americans took cheap money to buy homes far larger than they could afford and allowed the strong to exploit the weak. Strongly recommended. This title is also available as an audiobook. Lewis, Michael. 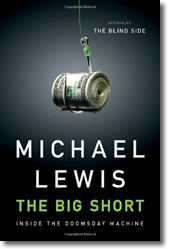 The big short : inside the doomsday machine. W. W. Norton, 2010. Master storyteller Malcolm Gladwell calls Michael Lewis the finest storyteller of our generation. Moneyball and Liar’s Poker made him one of the best business journalists today. Among his recent successes is The Blind Side. 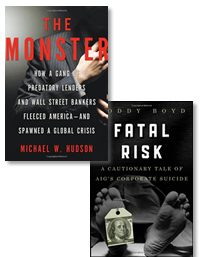 The Big Short is called the definitive book on the current recession. Having worked at Saloman Brothers in the 1980s, he provides an insider’s view of a perfect storm brewing. Lewis’ story revolves around several obscure Wall Street players who understood the housing market was built on a house of cards. 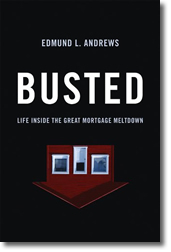 Andrews, Edmund L. Busted : life inside the great mortgage meltdown. W. W. Norton, 2009. Busted is a personal and penetrating account of one man’s experience with purchasing an overpriced house with a subprime mortgage. Written by an economics reporter for the New York Times, the author is aware of the economic and financial risks, yet he succumbs to temptation and buys a house he cannot afford. With his judgment impaired by his emotions – he is in love – Andrews enters into a vortex of debt from credit cards and desperate refinancing on his home. Andrews ends up ruined financially. He claims responsibility, but he also blames the mortgage brokers and real estate appraisers, money lenders and Wall Street players, credit rating agencies, institutional investors and Washington policymakers. Eventually he blames his ex-wife. One person he does not blame is his new wife. The Atlantic later reported that he failed to disclose Andrews’s new wife’s history of bankruptcy. This is not a book with a happy ending. Yet this blunt tale of personal ruin is riveting and well worth the investment in time. Tett, Gillian. Food’s Gold: How the bold dream of a small tribe at J.P.Morgan was corrupted by Wall Street greed and unleashed a catastrophe. Free Press, 2009. In 2003, Warren Buffet described derivatives as “financial weapons of mass destruction.” He was later proved to be a prophet. Yet a decade earlier, when credit derivatives were first conceived, they appeared to be a win-win for the financial world, freeing up capital, diversifying risk and increasing profits. This is the story of a small group of young employees at J.P.Morgan investment bank, who discovered the latent power of derivatives, products which initially seemed so promising, but later evolving into cyber-world instruments that even the financiers struggled to understand. 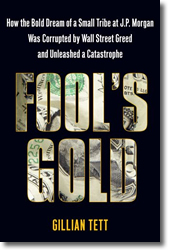 Fool’s Gold is a lively narrative that reports behind the scenes about the workings of an elite company and its bankers. 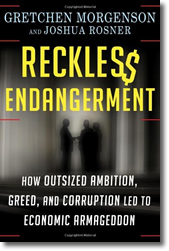 The story also describes the complicated financial instruments and shows how they combined with greed and stupidity to create a global financial disaster.